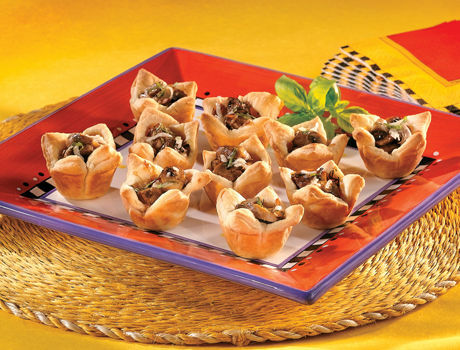 These savory appetizers will satisfy the most discriminating guest...the flavor of the mushrooms is highlighted with subtle hints of garlic, Parmesan cheese and basil, all tucked into a puff pastry tartlet. Heat the butter in a 10-inch skillet over medium heat. Add the mushrooms, onion and garlic and cook until tender and the liquid is evaporated. Remove the skillet from the heat. Stir in the cheese and basil. Unfold the pastry sheet on a lightly floured surface. Roll the pastry sheet into a 15x12-inch rectangle. Cut into 20 (3-inch) squares. 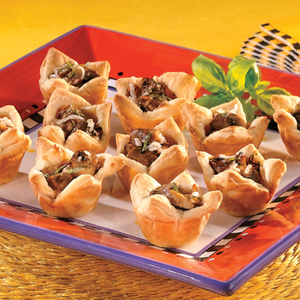 Press the squares into 20 (1 1/2-inch) mini muffin-pan cups. Place about 1 tablespoon filling into each square.